Unidentified microscopic fibrils attached to excised skin lesion. 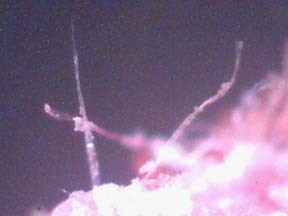 Photomicrograph 250x courtesy Morgellons Research Foundation. June 3, 2006 Albuquerque, New Mexico – Following my Earthfiles and Coast to Coast AM news reports on May 31, about the agonizing Morgellons disease which has emerged over the past five years, I have received many e-mails from viewers and listeners. Below is a sampling for consideration. Several months ago I had a problem with my gum under and to the side of a molar, inside my mouth. This new bump got very painful and I went to see a dentist and he was going to do possible mini-surgery to see what was so painful under this new rising bump. I could feel that it was like a hard piece of bone. My appointment was scheduled several days in advance but the bump was almost unbearable so while I could feel it with my finger nail and could tell it was somehow pushing out….or rather my body was pushing it out…I got a tweezers and I actually grabbed it and pulled the darn thing out myself! The pain was instantly gone and the spot healed very quickly, within hours! I looked at it with a powerful diamond loupe and it looked exactly like the photo of that little mass taken from a Child’s lip! I even wondered how on earth fibers were very much entwined into the live bone tissue. I didn’t even set it down before grabbing the loupe to look at it so I know those fibers were there and clearly within the tiny bone structure. I still have this little piece in a plastic bag and of course the bone is dried now…but the fibers are still there entwined! Objects emerging from lesion on child’s lip at 200x. 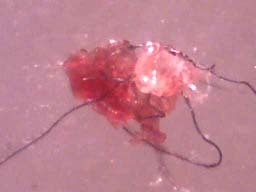 Image courtesy Morgellons Research Foundation. “It has to be an infectious agent where the bug genome carries a connective-tissue gene, say actin or pili, etc. One possible therapy might be dietary selenium or seleno-methionine: most AIDS patients die in part due to Se deficiency. The virus makes huge amounts of its own seleno-proteins, which then deplete normal amounts, leading to chronic fatigue. The only reliable way to i.d. the bug would be to micro-sequence its major protein-peptides, then work backward to get a PCR test. The Morgellons foundation could pay for such tests on contract from a mass-spec facility, if sufficient sample? Only a few hundred dollars. I am wondering if there might be a connection. The skin is the largest body organ. Things emerging from the skin are usually the body trying to clean itself out. If we’re breathing in polymers daily…or almost daily as in the case of Los Angeles…could it be that the body is trying to eliminate these polymers? I personally have noticed the associated fatigue and fog head associated with the spraying…This could be just the next step. The fact that it’s happening on such a wide scale could also be explained by the spraying… All just thoughts but maybe it will help somehow. “Only one of our local news shows here, in San Francisco, has even brought it up. Believe it or not, it’s a Fox affiliate(!). They have done three segments on it in the last 6 months or so. I am a healthy person. I am a vegetarian. I keep to virtually exclusively organic foods and products. I drink only bottled or filtered water/ice. Quite a while before I ever heard anyone anywhere mention anything remotely sounding like the symptoms associated with Morgellons, I was seriously doubting my state of mind because I was having the most bizarre experience. Intermittently, I was experiencing the sensation of a sharp ‘bite’ on my skin. When I looked at the location of the feeling, there was nothing there…or so I thought. Upon closer inspection, I noticed a little, black speck at these ‘bite’ spots. After a while, the specks were replaced with tiny, black or red fibers. Just a single barely noticeable fiber. In fact, I only noticed them because of the ‘biting’ sensation that caused me to investigate it. I don’t know if anyone else has this experience with the fibers…but I put a few of them on a white surface – I wanted to see what they were, and I was shocked to find that they would react to heat! If I placed my finger next to them or breathed gently toward them, they moved(! )in the direction of the heat source. If left alone for a while, some seemed to stop reacting, others did not. Anyway, I saw some doctors – they felt it was ‘…in my head.’ I knew better. Anyway, when I started to hear the news reports, it freaked me out a bit. I heard it may be associated with Lyme disease. I heard that the fibers are not living organisms, thank god. Anyway… I refuse to be a victim/sufferer/guinea pig, with this or anything. So I decided that I didn’t have this problem. And, I’m happy to say, I don’t suffer from it anymore. I am not saying that it was ‘all in my head,’ not at all. I feel it may be quite real for those who have it. I am just fortunate enough to know to my core that I create my reality and I eradicated that unwanted problem from myself and my life. (That may sound incredible/not believable but it is what happened/happens when I set my mind to something. I wish for health and healing to those suffering, from that or any health concern. I especially hope that the source of it is quickly identified and eradicated. I think it may be environmental – chemical exposure of some sort. Some people are more sensitive than others to man-made pollution. “I am a 64 year old Grandmother, RN, and a suffer of Morgellons. I believe I contracted this disease while in Belize for a month 4 years ago. I am a registered member of Morgellons…. I use Frontline for dogs. It helps, but does not totally rid the buggers. I probably will kill myself with this insecticide but don’t know what else to do. Next PostNext Gary McKinnon: An Electronic “Robin Hood”?